This is an ex-library book and may have the usual library/used-book markings inside. This book has soft covers. With usual stamps and markings, In good all round condition. No dust jacket. Very Good. To help pass the Sun Certified Web Component Developer (SCWCD) 1.4 exam, Head First Servlets and JSP's will show you how to write servlets and JSPs, what makes the Container tick, how to use the new JSP Expression Language (EL), and much more. Trade paperback (US). Glued binding. 854 p. Contains: Illustrations. Head First. Good. 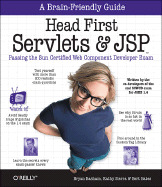 To help pass the Sun Certified Web Component Developer (SCWCD) 1.4 exam, Head First Servlets and JSP's will show you how to write servlets and JSPs, what makes the Container tick, how to use the new JSP Expression Language (EL), and much more. Trade paperback (US). Glued binding. 854 p. Contains: Illustrations. Head First.